i don't know if i've said this yet, but austin was by far the easiest place i've traveled to as a vegan ... everyone who works in the food industry seems to know what a vegan is, they know what stuff on their menus are vegan & there are plenty of options at each place. a perfect example is my third post from the lone star state : la condesa in the austin 2nd street district. about : "la condesa is an award-winning modern mexican restaurant, notably nominated for a james beard foundation award for 'best new restaurant'." check check & check. it was dark & the lighting was bad. sue me. a wide variety of salsas = nice. your basic guac = nice. 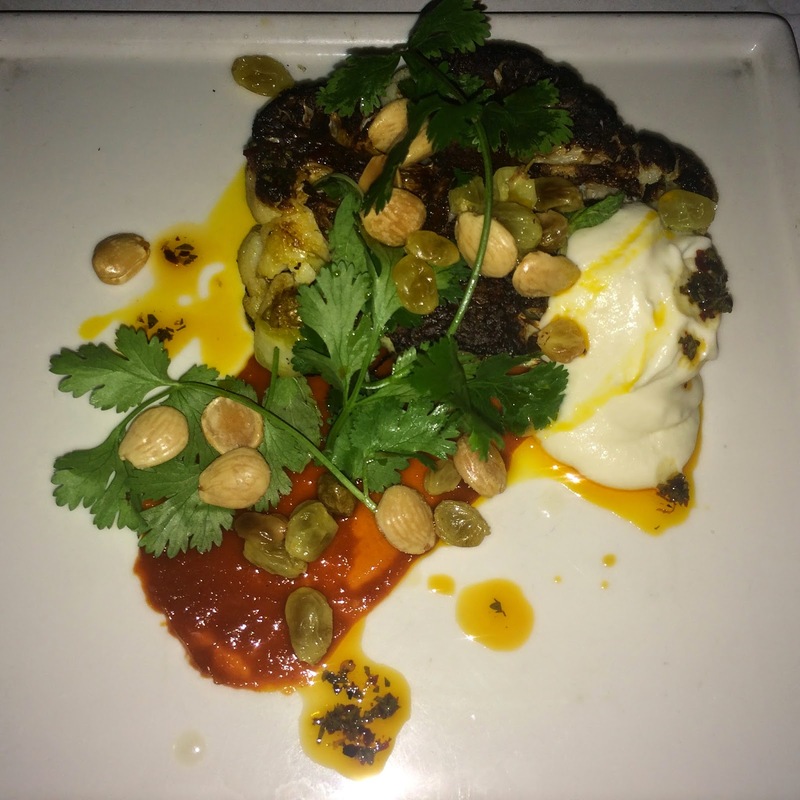 roasted cauliflower steak, chipotle raisin purée, marcona almond, chile de arbol vinaigrette, garlic-cauliflower soubise. this was fine. good, i'll even say. it just wasn't mexican food to me. this is where i think we slightly messed up. we thought we were taking the when in rome approach to eating mexican food in texas ... but really, it mexican-inspired fancy food. or maybe because that's what the vegan options were like. still good though. cured cactus, charred salsa, cebollitas. i had never had cactus in this preparation. quite tasty, but gooey. chard, giant white butter beans, garlic. so so so so delicious though. here's the thing ... lots of vegan options, tasty food, fun atmostphere, great area of the city ... la condesa has it all. but if you want mexican mexican food, i might go elsewhere.